(Newser) – "Mad" Mike Hughes finally went up—just like the self-taught rocket scientist always pledged, a mission accomplished for a guy more daredevil than engineer, who drew more comparisons to Wile E. Coyote than Evel Knievel. Hughes, the rocket man who believes the Earth is flat, propelled himself about 1,875 feet into the air Saturday before a hard landing in the Mojave Desert. He told the AP that outside of an aching back he's fine after the launch near Amboy, Calif. "I'm tired of people saying I chickened out and didn't build a rocket," he said. "I manned up and did it." The 61-year-old limo driver converted a mobile home into a ramp and modified it to launch from a vertical angle so he wouldn't fall back to the ground on public land. For months he's been working on overhauling his rocket in his garage. Hughes reached a speed around 350mph before pulling his parachute. Hughes was dropping too fast, though, and he had to deploy a second one. He landed with a thud and the rocket's nose broke in two places like it was designed to do. "This thing wants to kill you 10 different ways," said Hughes. "Am I glad I did it? Yeah. I guess. I'll feel it in the morning. ... At least I can go home and have dinner and see my cats tonight." 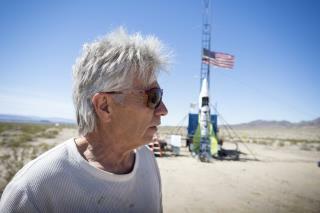 He got permission to launch on the land owned by Albert Okura, who bought Amboy in 2005 for $435,000. "Mike branded us as 'Rocket Town,'" Okura said. "It was amazing." Hughes always maintained that his mission isn't to prove the Earth is flat. "Do I believe the Earth is shaped like a Frisbee? I believe it is," he said. "Do I know for sure? No. That's why I want to go up in space." His future plans are simple: A run for governor. "This is no joke." "Mike Hughes": Biblical name, Irish name: can't be anything good. So science is right about the strength of pressure vessels but wrong about the earth. Someone needs to snap their fingers and break his trance. He isn't quite as stupid as he seems. He is smart enough to realize how gullible flat earth people are, so he is playing them to fund his toys.